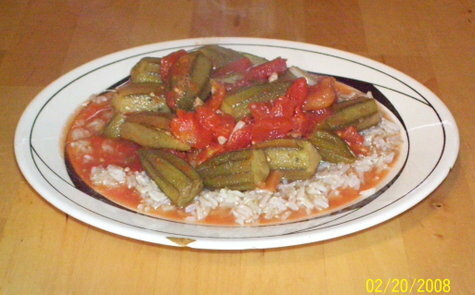 While it is preferable to use fresh okra and tomatoes for this dish, canned okra and diced tomatoes will work well when short on time or energy. This is a delicious, hearty, gut-healthy dish, loaded with vitamins A, Thiamin, B6, C, folic acid, riboflavin, calcium, zinc and dietary fiber. And both the mucilage (the slimy stuff around the seeds) and the fibre contained in the pod are excellent for gastrointestinal health. But enough about the health benefits. Let's talk taste! This is a very simple dish, but is just bursting with flavour. As with many Lebanese dishes, it is the holy trinity of olive oil, garlic and lemon that flavour this dish. The texture, however, is all in the okra. Saute minced garlic in olive oil for a minute or two (don't allow too much browning). Add okra and bring to boil. Add diced tomatoes and bring to boil. Simmer for a few minutes, or until okra is tender. Serve over brown basmati or other long-grain rice. Enjoy! For quite some time we bought Mr. Goudas Eston lentils. On the back of the bag is a recipe for green lentil soup that has become somewhat of a staple in our household ever since Jihan began cooking it. She modified it somewhat, of course, and made it her own. A practice I find rather amusing irritating is brand name plugging in back-of-the-bag or -can recipes. It's simply absurd. I am no more brand loyal than nationalistic. Unfortunately, most things we need and use are branded. I mention Mr. Goudas only to give them credit for the original recipe. When using sprouted green lentils the cooking time is greatly decreased. 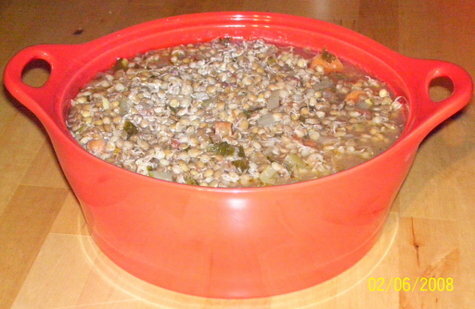 Put sprouted lentils in pot with 10 cups water. Bring to boil, then reduce heat and simmer for about 7 minutes (vs. 30 for unsprouted lentils). Reduce to low heat. Put garlic and olive oil in a large measuring cup or blender (we use measuring cup and hand blender) and mince. Note: if you blend too much you will have a garlic puree instead of minced garlic. Pour minced garlic and olive oil mixture into pan and add chopped carrots and celery. Saute, on medium-high heat, until onion is translucent. Add sauteed vegetables, bay leaves, canned tomatoes with juice and parsley to the lentils. Bring to boil again and simmer for another 10 minutes. If desired (we always do), add lemon juice to taste to each serving. Enjoy! 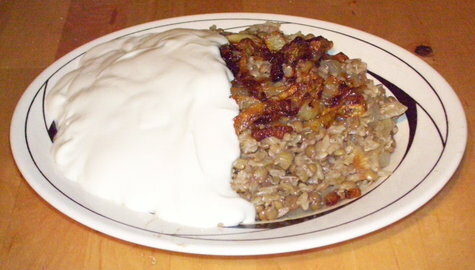 What you see above is Mjadrah, a Lebanese lentil and rice dish. This dish is, on its own, entirely vegan, though some people spoon yogurt over the top. We replaced yogurt with soygurt. Jihan had this at home growing up and, after I came across an online recipe for it recently, we decided that we needed to make it. We had 2 cups of sprouted lentils sitting in the fridge, just enough to make this wonderful dish. She didn't remember all the ingredients off-hand, so I did a little research, reading a number of versions to her until something rang a bell. Using sprouted lentils is our little innovation, as is the soygurt topping. Pour olive oil into a deep pan and, on medium heat, fry onion until golden (take 1/2 out and leave the rest until it is a rich brown). Put sprouted lentils in a medium pot and add just enough water to cover. Bring to boil and simmer for about 5 minutes, then add rice, salt, spices and half of the onion. Mix well and simmer for 2 or 3 more minutes. Serve with caramelized onion and soygurt. 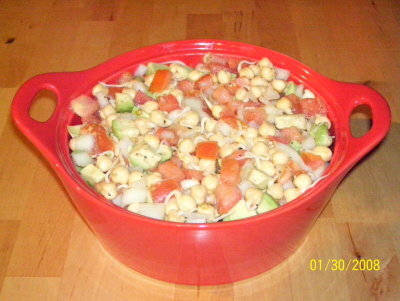 Put sprouted chickpeas, onion, tomatoes and avocado in a bowl. Add olive oil, lemon juice, black pepper and salt. Mix well and enjoy, on its own or with pita or tortilla chips. I recently received a copy of The Complete Book of Raw Food to review. I have a stack of books awaiting review, this one being near the bottom of the stack, so it will be a while before I get to it. But I have dipped into the book here and there. I am not a raw food vegan, and I don't see myself becoming one, but I do want to increase the amount of raw food in my diet. Anyway, I had soaked some garbanzo beans a couple of days ago in order to cook them to make hummus, but then didn't get around to cooking them right away. After draining them, it occurred to me to sprout them. There's got to be a raw version of hummus, I thought. Looking through the index of said book I found a recipe for raw hummus. Here it is as Jihan made it. Mouthwateringly delicious! In a bowl, put chopped garlic, sea salt, lemon juice, and chickpeas. Add tahineh, water, and olive oil and blend (we use a hand-blender) to desired consistency. Some like it very smooth. We like to leave a little texture. You may wish to taste it after blending and adjust salt, lemon, water and olive oil amounts according to taste. Drizzle olive oil over and sprinkle paprika on top (again, adjust to taste). Eat as a finger food with whole wheat pita, crackers, or tortilla chips, and a side of assorted pickles (wild cucumbers, kosher dills, pickled turnips, olives, etc.) and/or fresh green onions, or a quartered white or red onion. Fry cauliflower florets in vegetable oil until somewhat transparent, stirring occasionally. Add minced garlic and saute for a couple of minutes. Add lemon juice to desired tanginess (we put at least half a cup). Let this mixture simmer for 5-7 minutes. Add chopped mint and cilantro, as well as sea salt and water. Allow to cook for 6-8 minutes, stirring occasionally. Serve over brown basmati rice. Serves 2-4 (the two of us pigged out and ate it all at in one sitting). My partner made this dish based on a Lebanese recipe she had known growing up. While the garlic, oil and lemon juice make for a bold, tangy dish, the fresh mint and cilantro keep it wonderfully refreshing. For some reason she never thought to make it for us until that day. Too bad! It was soooo good!